Coutinho (right) pictured in conversation with his former coach Rafa Benitez. PHILIPPE COUTINHO WAS a “humble” boy who had “everything” in terms of ability even at the age of 18, according to Rafael Benitez. The Brazil star completed his protracted transfer to Barcelona on Saturday for a fee that could reportedly reach a club-record €160 million. Coutinho’s blockbuster move to Camp Nou comes almost five years on from his transfer to Liverpool from Inter for a bargain price said to have been just €10m. 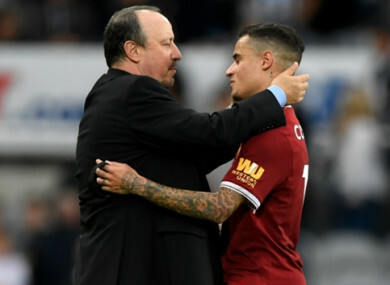 Benitez coached Coutinho for just a few months during his ill-fated spell with the Nerazzurri in 2010 but the Newcastle United boss admits it was clear then that they had a special talent. “It was a pleasant surprise to meet a player with the abilities of Philippe Coutinho,” Benitez told Mundo Deportivo. “We had the chance to have a boy who, even then, in our era at Inter, had a lot of quality, a great ability to cause problems. “He had an excellent pass, shot… he had everything, despite his young age, and a wide margin for improvement. 97 – Since his debut in February 2013, Philippe Coutinho has been directly involved in more goals in all competitions than any other Liverpool player (54 goals, 43 assists). Impact. “I remember that, aside from all of that, we were struck by the great vision he had to make the final pass, the decisive one. That’s something very important in football. “Best of all is that he was a very humble kid, a very hard-working professional and very eager to learn. He was willing to listen to improve his abilities. He had everything, everything. Benitez admits Coutinho could be shy at San Siro but insists it is difficult to find flaws in the playmaker’s game. “Something negative? Well, I don’t know if it’s negative or the result of his age, but I remember he was pretty shy,” added the former Liverpool and Real Madrid boss. Email “Coutinho 'had everything' at just 18 years old”. Feedback on “Coutinho 'had everything' at just 18 years old”.